The Elo system was originally invented as an improved chess rating system but is also used as a rating system for multiplayer competition in a number of video games, association football, gridiron football, basketball, Major League Baseball, competitive programming, and other games. A player's Elo rating is represented by a number which increases or decreases based upon the outcome of games between rated players. After every game, the winning player takes points from the losing one. The difference between the ratings of the winner and loser determines the total number of points gained or lost after a game. In a series of games between a high-rated player and a low-rated player, the high-rated player is expected to score more wins. If the high-rated player wins, then only a few rating points will be taken from the low-rated player. However, if the lower rated player scores an upset win, many rating points will be transferred. The lower rated player will also gain a few points from the higher rated player in the event of a draw. This means that this rating system is self-correcting. A player whose rating is too low should, in the long run, do better than the rating system predicts, and thus gain rating points until the rating reflects their true playing strength. 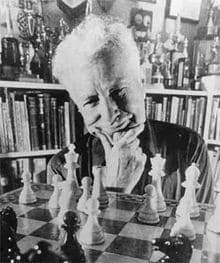 Arpad Elo was a master-level chess player and an active participant in the United States Chess Federation (USCF) from its founding in 1939. The USCF used a numerical ratings system, devised by Kenneth Harkness, to allow members to track their individual progress in terms other than tournament wins and losses. The Harkness system was reasonably fair, but in some circumstances gave rise to ratings which many observers considered inaccurate. On behalf of the USCF, Elo devised a new system with a more sound statistical basis. Elo's system replaced earlier systems of competitive rewards with a system based on statistical estimation. Rating systems for many sports award points in accordance with subjective evaluations of the 'greatness' of certain achievements. For example, winning an important golf tournament might be worth an arbitrarily chosen five times as many points as winning a lesser tournament. A statistical endeavor, by contrast, uses a model that relates the game results to underlying variables representing the ability of each player. Elo's central assumption was that the chess performance of each player in each game is a normally distributed random variable. Although a player might perform significantly better or worse from one game to the next, Elo assumed that the mean value of the performances of any given player changes only slowly over time. Elo thought of a player's true skill as the mean of that player's performance random variable. A further assumption is necessary, because chess performance in the above sense is still not measurable. One cannot look at a sequence of moves and say, "That performance is 2039." Performance can only be inferred from wins, draws and losses. Therefore, if a player wins a game, he is assumed to have performed at a higher level than his opponent for that game. Conversely if he loses, he is assumed to have performed at a lower level. If the game is a draw, the two players are assumed to have performed at nearly the same level. Elo did not specify exactly how close two performances ought to be to result in a draw as opposed to a win or loss. And while he thought it was likely that each player might have a different standard deviation to his performance, he made a simplifying assumption to the contrary. To simplify computation even further, Elo proposed a straightforward method of estimating the variables in his model (i.e. the true skill of each player). One could calculate relatively easily, from tables, how many games a player would be expected to win based on a comparison of his rating to the ratings of his opponents. If a player won more games than expected, his rating would be adjusted upward, while if he won fewer than expected his rating would be adjusted downward. Moreover, that adjustment was to be in exact linear proportion to the number of wins by which the player had exceeded or fallen short of his expected number. From a modern perspective, Elo's simplifying assumptions are not necessary because computing power is inexpensive and widely available. Moreover, even within the simplified model, more efficient estimation techniques are well known. Several people, most notably Mark Glickman, have proposed using more sophisticated statistical machinery to estimate the same variables. On the other hand, the computational simplicity of the Elo system has proven to be one of its greatest assets. With the aid of a pocket calculator, an informed chess competitor can calculate to within one point what his next officially published rating will be, which helps promote a perception that the ratings are fair. The USCF implemented Elo's suggestions in 1960, and the system quickly gained recognition as being both more fair and accurate than the Harkness rating system. Elo's system was adopted by the World Chess Federation (FIDE) in 1970. Elo described his work in some detail in the book The Rating of Chessplayers, Past and Present, published in 1978. Subsequent statistical tests have suggested that chess performance is almost certainly not distributed as a normal distribution, as weaker players have greater winning chances than Elo's model predicts. Therefore, the USCF and some chess sites use a formula based on the logistic distribution. Significant statistical anomalies have also been found when using the logistic distribution in chess. FIDE continues to use the rating difference table as proposed by Elo. The table is calculated with expectation 0, and standard deviation 2000 / 7. The normal and logistic distribution points are, in a way, arbitrary points in a spectrum of distributions which would work well. In practice, both of these distributions work very well for a number of different games. The phrase "Elo rating" is often used to mean a player's chess rating as calculated by FIDE. However, this usage is confusing and misleading, because Elo's general ideas have been adopted by many organizations, including the USCF (before FIDE), the Internet Chess Club (ICC), Free Internet Chess Server (FICS), Yahoo! Games, and the now-defunct Professional Chess Association (PCA). Each organization has a unique implementation, and none of them follows Elo's original suggestions precisely. It would be more accurate to refer to all of the above ratings as Elo ratings, and none of them as the Elo rating. Instead one may refer to the organization granting the rating, e.g. "As of August 2002, Gregory Kaidanov had a FIDE rating of 2638 and a USCF rating of 2742." It should be noted that the Elo ratings of these various organizations are not always directly comparable. For example, someone with a FIDE rating of 2500 will generally have a USCF rating near 2600 and an ICC rating in the range of 2500 to 3100. On FICS, the command "tell surveybot ratings fide estimate" gives a FIDE rating estimate based on the user's FICS rating. For top players, the most important rating is their FIDE rating. Since July 2012, FIDE issues a ratings list once every month. 5323 players had an active rating in the range 2200 to 2299, which is usually associated with the Candidate Master title. 2869 players had an active rating in the range 2300 to 2399, which is usually associated with the FIDE Master title. 1420 players had an active rating between 2400 and 2499, most of whom had either the International Master or the International Grandmaster title. 542 players had an active rating between 2500 and 2599, most of whom had the International Grandmaster title. 187 players had an active rating between 2600 and 2699, all of whom had the International Grandmaster title. 40 players had an active rating between 2700 and 2799. 9 players had a rating over 2800: Magnus Carlsen May 2014, Garry Kasparov July 1999, Fabiano Caruana Oct. 2014, Levon Aronian Marc. 2014, Viswanathan Anand Mar. 2011, Veselin Topalov July 2015, Hikaru Nakamura July 2015, Vladimir Kramnik May 2013, Alexander Grischuk Dec. 2014. November 2011 marked the first time five players had a rating of 2800 or higher. The highest ever FIDE rating was 2882, which Magnus Carlsen had on the May 2014 list. A list of the highest-rated players ever is at Comparison of top chess players throughout history. Divide this sum by the number of played games. This is a simplification, because it doesn't take account of K-factors (this factor is explained further below), but it offers an easy way to get an estimate of PR (performance rating). FIDE, however, calculates performance rating by means of the formula: Opponents' Rating Average + Rating Difference. Rating Difference is based on a player's tournament percentage score , which is then used as the key in a lookup table where is simply the number of points scored divided by the number of games played. Note that, in case of a perfect or no score is 800. The full table can be found in the FIDE handbook, B. Permanent Commissions 1.0. Requirements for the titles designated in 0.31, 1.48 online. A simplified version of this table is on the right. FIDE classifies tournaments into categories according to the average rating of the players. Each category is 25 rating points wide. Category 1 is for an average rating of 2251 to 2275, category 2 is 2276 to 2300, etc. For women's tournaments, the categories are 200 rating points lower, so a Category 1 is an average rating of 2051 to 2075, etc. The highest rated tournament has been category 23, with an average from 2801 to 2825. The top categories are in the table. FIDE updates its ratings list at the beginning of each month. In contrast, the unofficial "Live ratings" calculate the change in players' ratings after every game. These Live ratings are based on the previously published FIDE ratings, so a player's Live rating is intended to correspond to what the FIDE rating would be if FIDE were to issue a new list that day. Although Live ratings are unofficial, interest arose in Live ratings in August/September 2008 when five different players took the "Live" No. 1 ranking. The unofficial live ratings of players over 2700 were published and maintained by Hans Arild Runde at the Live Rating website until August 2011. Another website www.2700chess.com has been maintained since May 2011 by Artiom Tsepotan, which covers the top 100 players as well as the top 50 female players. Currently, the No. 1 spot in both the official FIDE rating list and the live rating list is taken by Magnus Carlsen. In general, a beginner is around 800, a mid-level player is around 1600, and a professional, around 2400. The K-factor, in the USCF rating system, can be estimated by dividing 800 by the effective number of games a player's rating is based on (Ne) plus the number of games the player completed in a tournament (m). where is the number of rated games won, is the number of rated games drawn, and is the number of events in which the player completed three or more rated games. Higher rating floors exist for experienced players who have achieved significant ratings. Such higher rating floors exist, starting at ratings of 1200 in 100 point increments up to 2100 (1200, 1300, 1400, ..., 2100). A player's rating floor is calculated by taking their peak established rating, subtracting 200 points, and then rounding down to the nearest rating floor. For example, a player who has reached a peak rating of 1464 would have a rating floor of 1464 − 200 = 1264, which would be rounded down to 1200. Under this scheme, only Class C players and above are capable of having a higher rating floor than their absolute player rating. All other players would have a floor of at most 150. There are two ways to achieve higher rating floors other than under the standard scheme presented above. If a player has achieved the rating of Original Life Master, their rating floor is set at 2200. The achievement of this title is unique in that no other recognized USCF title will result in a new floor. For players with ratings below 2000, winning a cash prize of $2,000 or more raises that player's rating floor to the closest 100-point level that would have disqualified the player for participation in the tournament. For example, if a player won $4,000 in a 1750 and under tournament, the player would now have a rating floor of 1800. Since 2005-06, human-computer chess matches have demonstrated that chess computers are capable of defeating even the strongest human players (Deep Blue versus Garry Kasparov). However, ratings of computers are difficult to quantify. There have been too few games under tournament conditions to give computers or software engines an accurate rating. Also, for chess engines, the rating is dependent on the machine a program runs on. For some ratings estimates, see Chess engine § Ratings. Pairwise comparisons form the basis of the Elo rating methodology (8. Rating System Theory). Elo made references to the papers of Good 1955, David 1959, Trawinski and David 1963 and Buhlman and Huber 1963. Performance isn't measured absolutely; it is inferred from wins, losses, and draws against other players. Players' rating depend on the ratings of their opponents, and the results scored against them. The difference in rating between two players determines an estimate for the expected score between them. Both the average and the spread of ratings can be arbitrarily chosen. Elo suggested scaling ratings so that a difference of 200 rating points in chess would mean that the stronger player has an expected score (which basically is an expected average score) of approximately 0.75, and the USCF initially aimed for an average club player to have a rating of 1500. A player's expected score is his probability of winning plus half his probability of drawing. Thus an expected score of 0.75 could represent a 75% chance of winning, 25% chance of losing, and 0% chance of drawing. On the other extreme it could represent a 50% chance of winning, 0% chance of losing, and 50% chance of drawing. The probability of drawing, as opposed to having a decisive result, is not specified in the Elo system. Instead a draw is considered half a win and half a loss. where and . Note that in the latter case, the same denominator applies to both expressions. This means that by studying only the numerators, we find out that the expected score for player A is times greater than the expected score for player B. It then follows that for each 400 rating points of advantage over the opponent, the expected score is magnified ten times in comparison to the opponent's expected score. Also note that . In practice, since the true strength of each player is unknown, the expected scores are calculated using the player's current ratings. When a player's actual tournament scores exceed his expected scores, the Elo system takes this as evidence that player's rating is too low, and needs to be adjusted upward. Similarly when a player's actual tournament scores fall short of his expected scores, that player's rating is adjusted downward. Elo's original suggestion, which is still widely used, was a simple linear adjustment proportional to the amount by which a player overperformed or underperformed his expected score. The maximum possible adjustment per game, called the K-factor, was set at K = 16 for masters and K = 32 for weaker players. This update can be performed after each game or each tournament, or after any suitable rating period. An example may help clarify. Suppose Player A has a rating of 1613, and plays in a five-round tournament. He or she loses to a player rated 1609, draws with a player rated 1477, defeats a player rated 1388, defeats a player rated 1586, and loses to a player rated 1720. The player's actual score is (0 + 0.5 + 1 + 1 + 0) = 2.5. The expected score, calculated according to the formula above, was (0.506 + 0.686 + 0.785 + 0.539 + 0.351) = 2.867. Therefore, the player's new rating is (1613 + 32x(2.5 − 2.867)) = 1601, assuming that a K-factor of 32 is used. Note that while two wins, two losses, and one draw may seem like a par score, it is worse than expected for Player A because his or her opponents were lower rated on average. Therefore, Player A is slightly penalized. If Player A had scored two wins, one loss, and two draws, for a total score of three points, that would have been slightly better than expected, and the player's new rating would have been (1613 + 32x(3 − 2.867)) = 1617. This updating procedure is at the core of the ratings used by FIDE, USCF, Yahoo! Games, the Internet Chess Club (ICC) and the Free Internet Chess Server (FICS). However, each organization has taken a different route to deal with the uncertainty inherent in the ratings, particularly the ratings of newcomers, and to deal with the problem of ratings inflation/deflation. New players are assigned provisional ratings, which are adjusted more drastically than established ratings. The principles used in these rating systems can be used for rating other competitions - for instance, international football matches. Elo ratings have also been applied to games without the possibility of draws, and to games in which the result can also have a quantity (small/big margin) in addition to the quality (win/loss). See Go rating with Elo for more. There are three main mathematical concerns relating to the original work of Elo, namely the correct curve, the correct K-factor, and the provisional period crude calculations. A 2012 study led by a team of Swedish psychologists at Lund University has spawned arguments for the inclusion of a fourth concern, albeit theoretical; intangibles. The first mathematical concern addressed by the USCF was the use of the normal distribution. They found that this did not accurately represent the actual results achieved, particularly by the lower rated players. Instead they switched to a logistic distribution model, which the USCF found provided a better fit for the actual results achieved. FIDE still uses the normal distribution as the basis for rating calculations as suggested by Elo himself. The second major concern is the correct "K-factor" used. The chess statistician Jeff Sonas believes that the original K=10 value (for players rated above 2400) is inaccurate in Elo's work. If the K-factor coefficient is set too large, there will be too much sensitivity to just a few, recent events, in terms of a large number of points exchanged in each game. Too low a K-value, and the sensitivity will be minimal, and the system will not respond quickly enough to changes in a player's actual level of performance. Elo's original K-factor estimation was made without the benefit of huge databases and statistical evidence. Sonas indicates that a K-factor of 24 (for players rated above 2400) may be more accurate both as a predictive tool of future performance, and also more sensitive to performance. Ranking up on a loss is not possible. Players above 2400: K-factor of 16 used. K = 40, for a player new to the rating list until the completion of events with a total of 30 games and for all players until their 18th birthday, as long as their rating remains under 2300. K = 20, for players with a rating always under 2400. K = 10, for players with any published rating of at least 2400 and at least 30 games played in previous events. Thereafter it remains permanently at 10. K = 30 (was 25), for a player new to the rating list until the completion of events with a total of 30 games. K = 15, for players with a rating always under 2400. 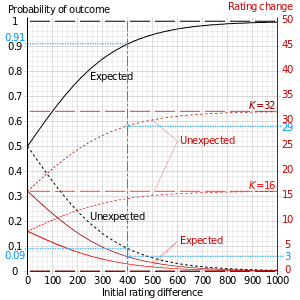 The gradation of the K-factor reduces ratings changes at the top end of the rating spectrum, reducing the possibility for rapid ratings inflation or deflation for those with a low K factor. This might in theory apply equally to an online chess site or over-the-board players, since it is more difficult for players to get much higher ratings when their K-factor is reduced. When playing online, it may simply be the selection of highly rated opponents that enables 2800+ players to further increase their rating, since a grandmaster on the ICC playing site can play a string of different opponents who are all rated over 2100. In over-the-board events, it would only be in very high level all-play-all events that a player would be able to engage that number of 2700+ opponents, while in a normal open Swiss-paired chess tournament, frequently there would be many opponents rated less than 2500, reducing the ratings gains possible from a single contest. In some cases the rating system can discourage game activity for players who wish to protect their rating. In order to discourage players from sitting on a high rating, a recent proposal by British Grandmaster John Nunn for choosing qualifiers to the chess world championship included an activity bonus, to be combined with the rating. Beyond the chess world, concerns over players avoiding competitive play to protect their ratings caused Wizards of the Coast to abandon the Elo system for Magic: the Gathering tournaments in favour of a system of their own devising called "Planeswalker Points". A more subtle issue is related to pairing. When players can choose their own opponents, they can choose opponents with minimal risk of losing, and maximum reward for winning. Such a luxury of being able to hand-pick your opponents is not present in Over-the-Board Elo type calculations, and therefore this may account strongly for the ratings on the ICC using Elo which are well over 2800. Particular examples of 2800+ rated players choosing opponents with minimal risk and maximum possibility of rating gain include: choosing computers that they know they can beat with a certain strategy; choosing opponents that they think are overrated; or avoiding playing strong players who are rated several hundred points below them, but may hold chess titles such as IM or GM. In the category of choosing overrated opponents, new-entrants to the rating system who have played fewer than 50 games are in theory a convenient target as they may be overrated in their provisional rating. The ICC compensates for this issue by assigning a lower K-factor to the established player if they do win against a new rating entrant. The K-factor is actually a function of the number of rated games played by the new entrant. Therefore, Elo ratings online still provide a useful mechanism for providing a rating based on the opponent's rating. Its overall credibility, however, needs to be seen in the context of at least the above two major issues described - engine abuse, and selective pairing of opponents. The ICC has also recently introduced "auto-pairing" ratings which are based on random pairings, but with each win in a row ensuring a statistically much harder opponent who has also won x games in a row. With potentially hundreds of players involved, this creates some of the challenges of a major large Swiss event which is being fiercely contested, with round winners meeting round winners. This approach to pairing certainly maximizes the rating risk of the higher-rated participants, who may face very stiff opposition from players below 3000, for example. This is a separate rating in itself, and is under "1-minute" and "5-minute" rating categories. Maximum ratings achieved over 2500 are exceptionally rare. It has been suggested that an overall increase in ratings reflects greater skill. The advent of strong chess computers allows a somewhat objective evaluation of the absolute playing skill of past chess masters, based on their recorded games, but this is also a measure of how computerlike the players' moves are, not merely a measure of how strongly they have played. The number of people with ratings over 2700 has increased. Around 1979 there was only one active player (Anatoly Karpov) with a rating this high. In 1992 Viswanathan Anand was only the 8th player in chess history to reach the 2700 mark at that point of time. This increased to 15 players by 1994. 33 players had a 2700+ rating in 2009 and 44 as of September 2012. The current benchmark for elite players lies beyond 2800. One possible cause for this inflation was the rating floor, which for a long time was at 2200, and if a player dropped below this they were stricken from the rating list. As a consequence, players at a skill level just below the floor would only be on the rating list if they were overrated, and this would cause them to feed points into the rating pool. In July 2000 the average rating of the top 100 was 2644. By July 2012 it had increased to 2703. In a pure Elo system, each game ends in an equal transaction of rating points. If the winner gains N rating points, the loser will drop by N rating points. This prevents points from entering or leaving the system when games are played and rated. However, players tend to enter the system as novices with a low rating and retire from the system as experienced players with a high rating. Therefore, in the long run a system with strictly equal transactions tends to result in rating deflation. In 1995, the USCF acknowledged that several young scholastic players were improving faster than what the rating system was able to track. As a result, established players with stable ratings started to lose rating points to the young and underrated players. Several of the older established players were frustrated over what they considered an unfair rating decline, and some even quit chess over it. Because of the significant difference in timing of when inflation and deflation occur, and in order to combat deflation, most implementations of Elo ratings have a mechanism for injecting points into the system in order to maintain relative ratings over time. FIDE has two inflationary mechanisms. First, performances below a "ratings floor" are not tracked, so a player with true skill below the floor can only be unrated or overrated, never correctly rated. Second, established and higher-rated players have a lower K-factor. New players have a K=30, which drops to K=15 after 30 played games, and to K=10 when the player reaches 2400. The current system in the United States includes a bonus point scheme which feeds rating points into the system in order to track improving players, and different K-values for different players. Some methods, used in Norway for example, differentiate between juniors and seniors, and use a larger K factor for the young players, even boosting the rating progress by 100% for when they score well above their predicted performance. Rating floors in the USA work by guaranteeing that a player will never drop below a certain limit. This also combats deflation, but the chairman of the USCF Ratings Committee has been critical of this method because it does not feed the extra points to the improving players. A possible motive for these rating floors is to combat sandbagging, i.e. deliberate lowering of ratings to be eligible for lower rating class sections and prizes. American college football used the Elo method as a portion of its Bowl Championship Series rating systems from 1998 to 2013, after which the BCS was replaced by the College Football Playoff. Jeff Sagarin of USA Today publishes team rankings for most American sports, including Elo system ratings for college football. The operators of the BCS used his Elo ratings as part of a formula to determine the annual participants in the BCS National Championship Game. The use of rating systems was effectively scrapped with the creation of the College Football Playoff in 2014; participants in the CFP and its associated bowl games will be chosen by a selection committee. National Scrabble organizations compute normally distributed Elo ratings except in the United Kingdom, where a different system is used. The North American Scrabble Players Association has the largest rated population of active members, numbering about 2,000 as of early 2011. Lexulous also uses the Elo system. The popular First Internet Backgammon Server calculates ratings based on a modified Elo system. New players are assigned a rating of 1500, with the best humans and bots rating over 2000. The same formula has been adopted by several other backgammon sites, such as Play65, DailyGammon, GoldToken and VogClub. VogClub sets a new player's rating at 1600. The European Go Federation adopted an Elo-based rating system initially pioneered by the Czech Go Federation. The Groshin's Score an Elo-based game. In other sports, individuals maintain rankings based on the Elo algorithm. These are usually unofficial, not endorsed by the sport's governing body. The World Football Elo Ratings rank national teams in men's football. In 2006, Elo ratings were adapted for Major League Baseball teams by Nate Silver of Baseball Prospectus. Based on this adaptation, Baseball Prospectus also makes Elo-based Monte Carlo simulations of the odds of whether teams will make the playoffs. In 2014, Beyond the Box Score, an SB Nation site, introduced an Elo ranking system for international baseball. One of the few Elo-based rankings endorsed by a sport's governing body is the FIFA Women's World Rankings, based on a simplified version of the Elo algorithm, which FIFA uses as its official ranking system for national teams in women's football. In 2015, Nate Silver and Reuben Fischer-Baum produced Elo ratings for every National Basketball Association team and season through the 2014 season. Sports-Reference.com uses the Elo rating system to rate the best professional players in basketball, football, baseball (batters and pitchers rated separately), and hockey (goalies and skaters rated separately). In 2014 FiveThirtyEight created Elo-based ratings and win-projections for the American professional National Football League. The English Korfball Association rated teams based on Elo ratings, to determine handicaps for their cup competition for the 2011/12 season. Elohockey.com uses the Elo rating system to rank national ice hockey teams. Rugbyleagueratings.com uses the Elo rating system to rank international and club rugby league teams. Various online games use Elo ratings for player-versus-player rankings. Since 2005, Golden Tee Live has rated players based on the Elo system. New players start at 2100, with top players rating over 3000. In Guild Wars, Elo ratings are used to record guild rating gained and lost through Guild versus Guild battles, which are two-team fights. The initial K-value was 30, but was changed to 5 in January 2007, then changed to 15 in July 2009. World of Warcraft formerly used the Elo Rating system when teaming up and comparing Arena players, but now uses a system similar to Microsoft's TrueSkill. The MOBA game League of Legends used an Elo rating system prior to the second season of competitive play. The game Puzzle Pirates uses the Elo rating system to determine the standings in the various puzzles. Roblox introduced the Elo rating in 2010. The browser game Quidditch Manager uses the Elo rating to measure a team's performance. Another recent game to start using the Elo rating system is AirMech, using Elo ratings for 1v1, 2v2, and 3v3 random/team Matchmaking. Despite questions of the appropriateness of using the Elo system to rate games in which luck is a factor, trading-card game manufacturers often use Elo ratings for their organized play efforts. The DCI (formerly Duelists' Convocation International) used Elo ratings for tournaments of Magic: The Gathering and other Wizards of the Coast games. However, the DCI abandoned this system in 2012 in favour of a new cumulative system of "Planeswalker Points", chiefly because of the above-noted concern that Elo encourages highly rated players to avoid playing to "protect their rating". Pokémon USA uses the Elo system to rank its TCG organized play competitors. Prizes for the top players in various regions included holidays and world championships invites until the 2011-2012 season, where awards were based on a system of Championship Points, their rationale being the same as the DCI's for Magic: The Gathering. Similarly, Decipher, Inc. used the Elo system for its ranked games such as Star Trek Customizable Card Game and Star Wars Customizable Card Game. Moreover, online judge sites are also using Elo rating system or its derivatives. For example, TopCoder is using a modified version based on normal distribution, while Codeforces is using another version based on logistic distribution. The Elo rating system has been used in soft biometrics. Soft biometrics concerns the identification of individuals using human descriptions. Comparative descriptions were utilized alongside the Elo rating system to provide robust and discriminative 'relative measurements', permitting accurate identification. The Elo rating system has also been used in biology for assessing male dominance hierarchies. Graphs of probabilities and Elo rating changes (for K=16 and 32) of expected outcome (solid curve) and unexpected outcome (dotted curve) vs initial rating difference For example, player A starts with a 1400 rating and B with 1800 in a tournament using K = 32 (brown curves). The blue dash-dot line denotes the initial rating difference of 400 (1800 - 1400). The probability of B winning, the expected outcome, is 0.91 (intersection of black solid curve and blue line); if this happens, A's rating decreases by 3 (intersection of brown solid curve and blue line) to 1397 and B's increases by the same amount to 1803. Conversely, the probability of A winning, the unexpected outcome, is 0.09 (intersection of black dotted curve and blue line); if this happens, A's rating increases by 29 (intersection of brown dotted curve and blue line) to 1429 and B's decreases by the same amount to 1771. The Elo rating system was featured prominently in The Social Network during the algorithm scene where Mark Zuckerberg released Facemash. In the scene Eduardo Saverin writes mathematical formulas for the Elo rating system on Zuckerberg's dormitory room window. Behind the scenes, the movie claims, the Elo system is employed to rank girls by their attractiveness. The equations driving the algorithm are shown briefly, written on the window however are slightly incorrect.